Last week, I talked with Rhonda Jones-Gillespie, news editor at the Chicago Defender and I feel like I need to follow up with her. It wasn’t until after our conversation that I realized why there seemed to be a disconnect around some of my questions. While the Defender does report about African-American communities in Chicago, a big part of what they do, and what I didn’t really get, is ground city and national news stories in the African American experience in Chicago. While I’ve been most interested in looking at how a story local to one community might connect with a broader audience, I’ve overlooked the opposite, but equally important, trajectory. It’s one that journalists have been doing for a long time (though perhaps less so as news organizations become more resource bound) – taking a story and picking out the most important aspects for a local audience or looking at a broader policy’s impact on a particular community. This week, I was finally able to sit down with Icoi Johnson and Samuel Vega, the recipients of WBEZ’s Prizker Fellowship, which I had written about previously. I found the fellows’ backgrounds and outlooks to be pretty different, which was interesting and probably a good thing for WBEZ. Vega, who is from Humboldt Park and seemed pretty involved in the community offered some interesting insight into WBEZ’s bureau in the neighborhood. Vega said he had noticed the storefront bureau, but had never been inside it until he toured it as part of his training for the fellowship. He said it often appeared closed and that he was more familiar with the reporter who runs the bureau because of his coverage of events in Humboldt Park. Vega’s anecdote indicates that connecting with different news communities may be a little more complicated than simply setting up shop. Perhaps a better approach might be the coffee shop newsroom experiments that Poynter wrote about extensively at the beginning of this month. Placing a reporter in an already trafficked space like a coffee shop may make reporters more accessible to the general public than a space exclusive to the news organization. Some of the benefits of putting reporters or “newsrooms” in coffee shops seem pretty cool: more transparency/accountability, more audience understanding of the reporting process, developing new sources, getting new framings for stories or new dimensions for stories of which the reporter is already aware and recruiting citizen journalists. This week I had my own experience with reporting and coffee shops. I often work in coffee shops because I find them more convenient, and often less distracting than heading down to the Medill Newsroom. While I use them primarily for convenience, they can still be a good way to connect with sources. However, you have to go to the right coffee shop. In reporting a story about LGBTQA youth of color in Boystown and a parking policy proposed by some residents designed to deter the youth, I did a lot of writing in Lakeview coffee shops. I usually went to one close to my house a little east of Boystown or one close to Boystown but seemingly catering to a more particular customer demographic. I liked the coffee shops I chose because they were locally owned and independent, there was interesting art on the wall and employees sometimes seemed like they were hanging out with friends or family as much as they were serving customers, creating a casual, comfortable atmosphere. But, because they were somewhat more expensive and closed around 10 p.m., they didn’t really attract customers who were young people of color coming to hang out in the neighborhood. 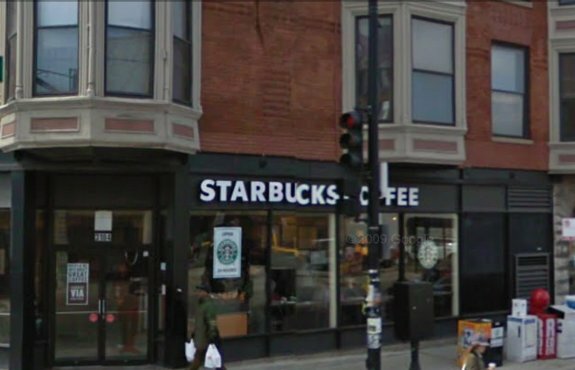 The night I spent writing at the Starbucks at the corner of Belmont Avenue and Clark Street, a wide range of customers came in, including folks who could have been sources for my story. While I could have gone out on the streets searching for people who could tell me their experience of coming to the neighborhood, a common thread in what youth I had interviewed told me is that they often feel profiled by police and neighborhood residents. Both residents and youth described sidewalk confrontations that escalated and didn’t lead to a productive dialog. As a reporter, I didn’t want to contribute to these dynamics. Spaces like coffee shops are important for reporting across dynamics like the ones in Boystown because they’re more neutral. People from a variety of backgrounds can be on equal footing in the coffee shop as patrons and engaged in the same activities, like working on a laptop. Had I spent the entire quarter working at that Starbucks, I might have been able to meet some sources with a good insight into the dynamic in a way that developed out of a more organic conversation, over music or helping someone reach a power outlet) rather than cornering people on the street. Also, the public nature of the coffee shop could have attracted other people into the conversation, adding multiple perspectives to the reporting and perhaps even bridging the resident/visitor divide. While there are still funky independents eking out a living on the retail margins, most coffeehouses and designer roasters are niche markets, like purveyors of artisan cheeses, hand-painted T-shirts and limited-edition sneakers. They appeal to those on the trendy, cutting edge and survive by exclusivity—by pleasing a small, loyal and financially privileged. Starbucks, on the other hand, has been able to risk expansion from urban business cores and upscale suburbs into more modest settings, where it often provides the only meeting place that is neither a noisy fast-food restaurant nor a bar and that is often surprisingly multiracial. Poynter ethicist Kelly McBride zeroed in on that idea of search-engine optimization, noting that the AP is being punished for their stand against the term “ground zero mosque” by not appearing very highly on the all-important news searches for that phrase. In order to stay relevant to search engines, news organizations have to continue using an inaccurate term once it’s taken hold, she concluded. In response, McBride suggested pre-emptively using factchecking resources to nip misconceptions in the bud. “Now that Google makes it impossible to move beyond our distortions — even when we know better — we should be prepared,” she said. Coddington also pointed out that Online Journalism Review’s Brian McDermott pinpointed our news consumption patterns as the culprit for the proliferation of incorrect terms for things. As we move more quickly from media to media, terms like “ground zero mosque” have more sticking power than Park51 or the Cordoba Center. The tough choice of deciding between content discovery and accuracy is the same one I wrote about regarding the phrase “sissy bounce” and New Orleans artists’ distaste for the term. In a pretty interesting, but unrelated thread, Anthony Neal, a scholar who studies Black popular culture, posted some tracks from New Orleans in the 1960s that refer to a dance called “The Sophisticated Cissy.” Still, even if the term “sissy” may have some interesting connections to New Orleans musical history, it’s important to remember that contemporary artists don’t use the term to identify their work.